Photo from the super-secret planning meeting. 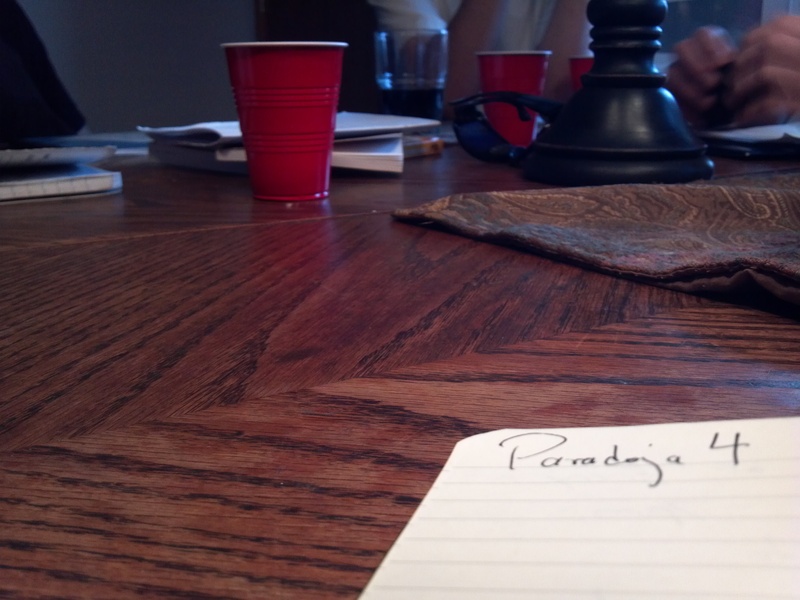 I’ve written before about the group of young writers and performers that I produce and direct called Paradoja Studios (paradojastudios.com). We’ve created and produced three completely original stage productions, entirely voluntarily, and for a budget of about 75 cents. The previous shows have been a combination of sketch comedy, sketch drama, and short films. As we’ve worked on each show they’ve become more cohesive, thematically, even if they’ve consisted of stand-alone pieces. The brain trust of the group decided that the next logical step is to write a full length play, using inspiration from past material. The only problem with that? This group has never written a play before – either together or individually. The experience is in writing short pieces – not a full length. So we had a meeting: me, Mike (one of the co-creators and main writer; hear an interview with him here), and four other members, to try and hash things out. This is a work in progress, of course. Playwriting is new to us. So here are some steps that we’ve taken to lay the early groundwork. To get off the ground, the first thing we had to do was think of a story. A play without a good story (beginning, middle, end, climax, resolution, etc.) isn’t much of a play at all. We weren’t starting from scratch, so we had some idea of the elements that we wanted to include. Once we had the basic idea of a story – using characters, conflicts, and goals that we’ve already created – we started to look at the characters first and tried to think of ways to stretch out their stories. How do they connect? How do they affect each other? What are their goals? Well, of course, once we were firm in our protagonist and one or two other main supporting characters, the story started to shift from our original idea. And if I told you that the length (two hours running time) wasn’t intimidating, I’d be lying. Regardless of what we have left to do, we still accomplished one of the most important steps of any creative endeavor – starting. 1. A play needs a solid story that goes somewhere. And don’t forget the importance of a beginning, middle, and end – the story needs a path. 2. A play needs a central character (or characters), with depth and emotion (they are humans, after all), and good supporting characters that affect and influence the protagonist – positively or negatively – and that take the journey with the central character(s). 3. There has to be at least one major central conflict (and many smaller conflicts) – without it, there is no motivation, no catalyst for action, and no resolution. Thus, the journey needn’t happen. This project is still in the very early stages, but having a basic idea is better than no idea. I’ll keep you updated as this process continues. Have you written a play before? Share your experiences and advice with us (we’re all ears…).